YouCanMakeThis.com has teamed up with A Simple Kinda Life for this great giveaway! 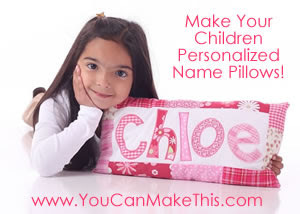 Personalized Name Pillows are so easy and fun to make! The instructions to make this book we really easy and even though my daughter and I haven't done this yet, I plan on getting some fabric soon so we can do this! (I don't keep fabric on hand...) They look like so much fun! 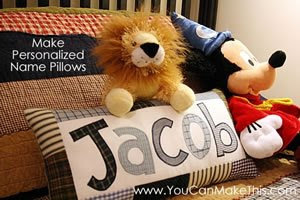 These pillows are completely your design, YouCanMakeThis.com just helps you do it! YouCanMakeThis.com wants to give TWO of my readers instructions on how to make this project! To win, tell me, if you won this, how many children would you be making these personalized pillows for? This giveaway will end on 5/22/09 at midnight EST. Winners will be picked using random.org and will be emailed. Oh, how cute! Just one kiddo for me. I have 2 girls that I definitely would make for but I think they would make great baby shower gifts- if the names are known. Adorable! I would make this for my lovely daughter and depending on how THAT went possibly for bday presents for five of her buddies. One for me for sure, maybe one for my little sister and 4 for my older sister. I would make 3 for each one of my children. Fave my blog at Technorati- Naddez. I would love to make these for all three of my kids! Thanks for the chance to win. I subscribed but will activate tomorrow when I am able to check my email. If I won I would make them for my two Grandsons and my Great Niece who will be born in July. If I win, I will give it to one of my co-workers after I make one for my three kids. I work in a program with students who have moderate special needs and we are always looking for new projects for the kids to do. The first time it got used it would be with a total of 12 kids and could even be used the following year. I love that website....they have some of the best ideas! I am a follower of you on twitter (username spalka). Look forward to seeing your updates. what a cool idea! Right off I would make 5 of them for my kids and niece and nephew. These would make great graduation gifts too and I'm thinking even Christmas gifts with the last name to sit on a couch, chair, etc. I have 3 children that I would like to make this for. and who knows maybe a few birthday gifts too.